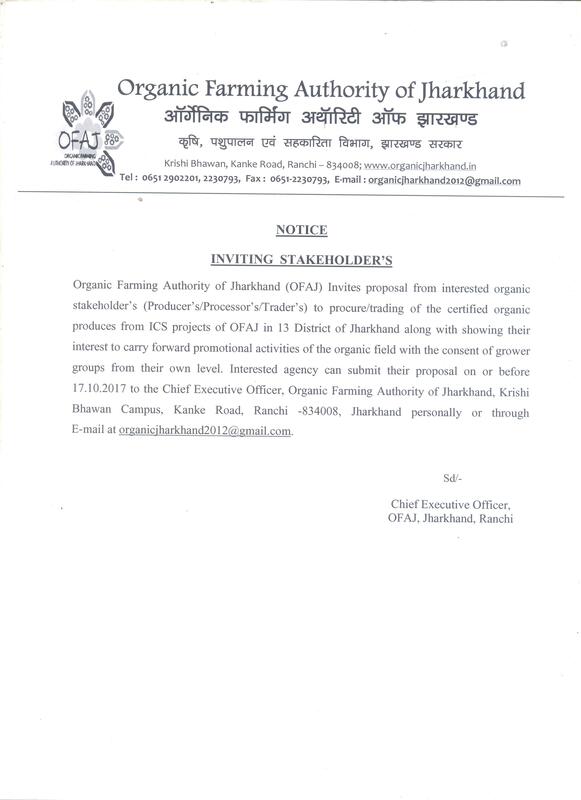 Vacancy of OFAJ. For more details see Important links. 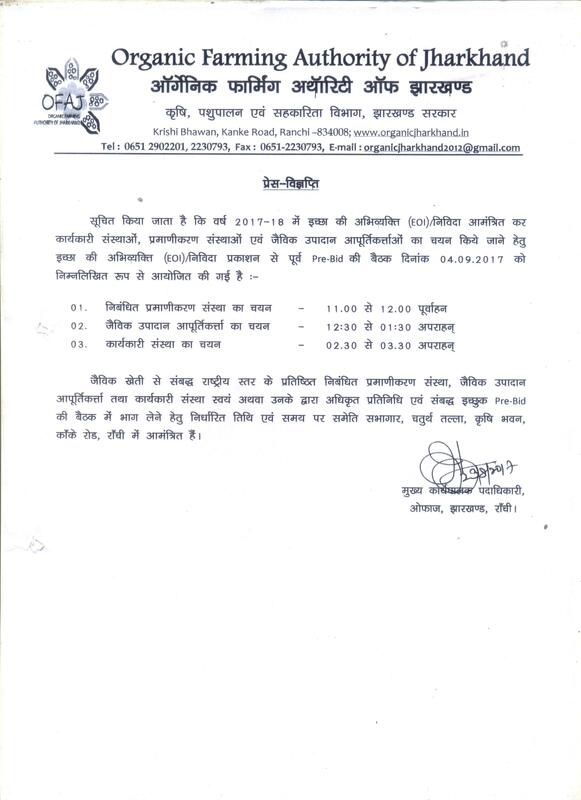 Interview date of the posts advertised under OFAJ has been rescheduled on 16.06.2014 at 10:30 AM. Please refer the circular page of website for the list of shortlisted candidates called for interview. Interview date of the posts advertised under OFAJ has been rescheduled on 24.06.2014 at 10:30 AM. 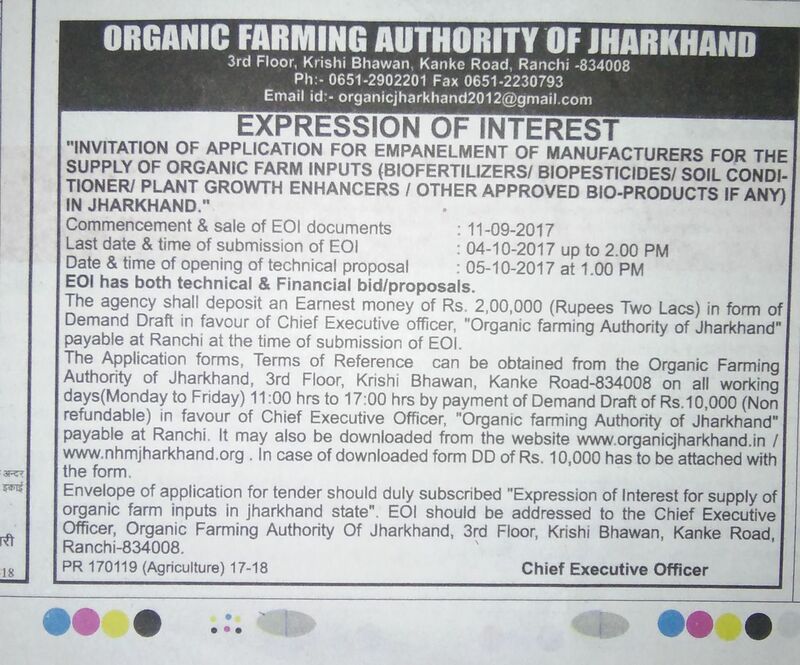 Extension of Submission Date of EOI upto 10-10-2017. Regarding Tender Proceeding for Certification Agency & Service Providers, Please refer to Circular. Regarding Tender Proceeding for Bio Inputs , Please refer to Circular. Final Proceedings of Tender Regarding Service Providers/ Certification Agency & Inputs Manufacturers has been uploaded in Circular Section. 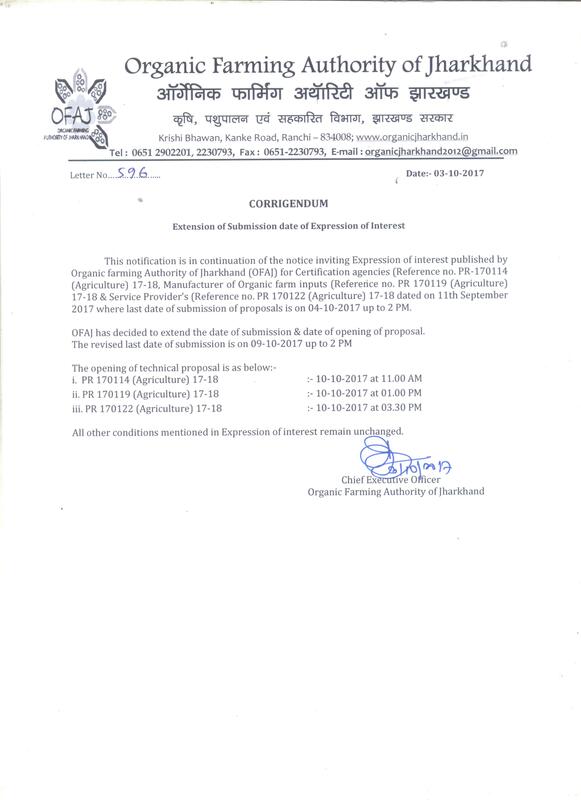 Proceeding for Allotment of Area Under NPOP NOP Certification & ICS Management, Please refer circular section. Regarding MOU of Service Providers, Certification Agency & Inputs Providers, please refer to Circular Section. List of District & Block Wise Area Distribution of Service Providers, Certification Agencies & SOP, please refer to Circular Section. 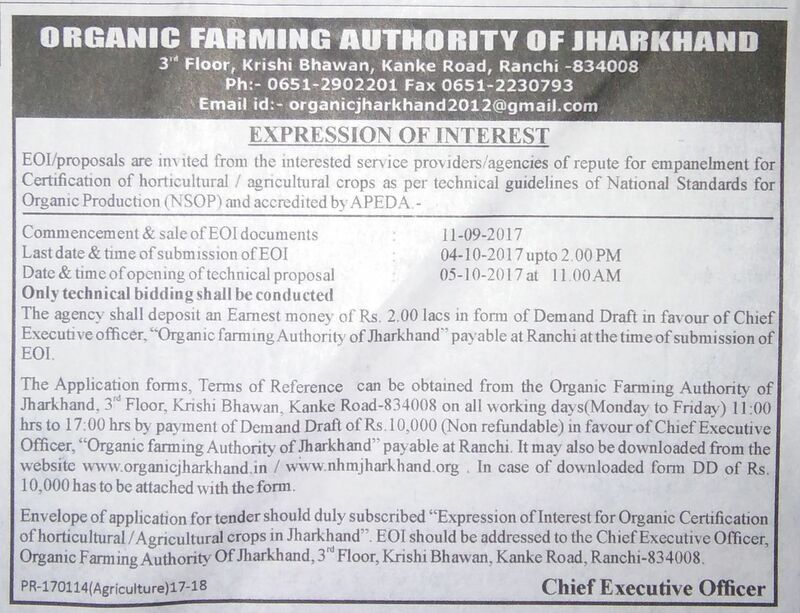 PKVY Pre- Bid Meeting to be held on 15-05-2018 at Krishi Bhawan, 3rd Floor, Kanke Road, Ranchi, Download draft for discussion, please refer to Circular Section. 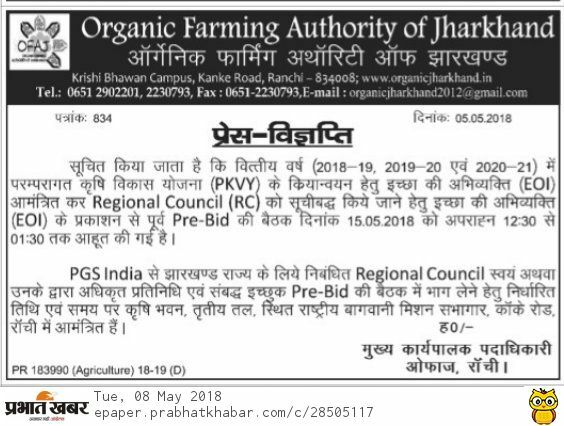 News Paper Cutting of PKVY 150 Clusters (Regarding Pre-Bid Meeting to be held on 15.05.2018 at Krishi Bhawan, Kanke Road, Ranchi- For news, Please refer to Publication section. Proceeding (Pre-Bid Meeting held on 15-05-2018 for 150 Clusters for FY 2018-19, 2019-20 & 2020-21.) Download Document, please refer to Circular Section. Tender Documents for PKVY 150 Clusters (FY- 2018-19, 2019-20 & 2020-21) for download, please refer to Circular Section. submission of Grievances, Please refer to Circular Section. Selection of Regional Council & Allotment of Area (PKVY 150 Clusters) proceeding, download, please refer to circular section. 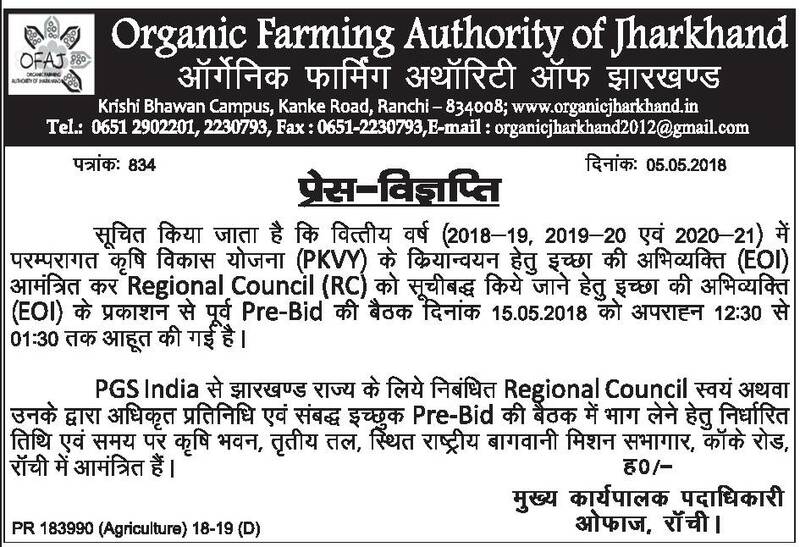 Vacancy of OFAJ. Published on 14/02/2014 Prabhat Khabar. Jharkhand became a state by separating from Bihar in 2000.Though it is mineral rich state, more than 70% of population depend on agriculture. The main crop is paddy grown by almost all the farmers mainly in kharif season. The farmers use to get poor yield with very less profit. The horticultural crops like fruits, vegetables, spices etc are also grown by the farmers and some vegetables like cole crops, French bean, tomato are grown throughout the year. Farmer’s indiscriminate use of insecticide & fungicide in these crops make it unusable for food & create many diseases. 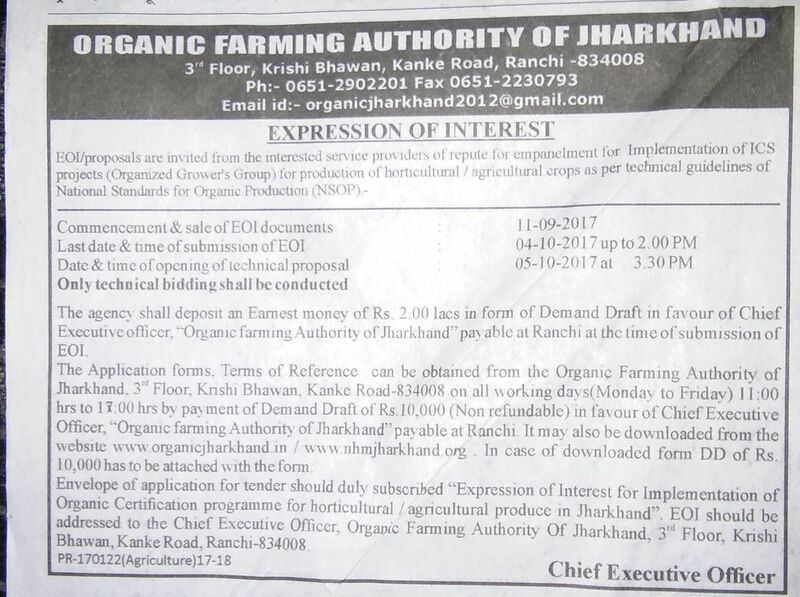 Bhindi ki Jaivik utpadan vidhi etc. submission of Grievances of PKVY 150 Clusters.